The Victory Octane has been unveiled and it’s the manufacturer’s most powerful bike ever. There’s a lot to live up to with a name like Octane so its power shouldn’t come as a surprise. It clears 100hp at 8,000rpm and puts out 73lb-ft of torque at 6,000, thanks to a number of features. 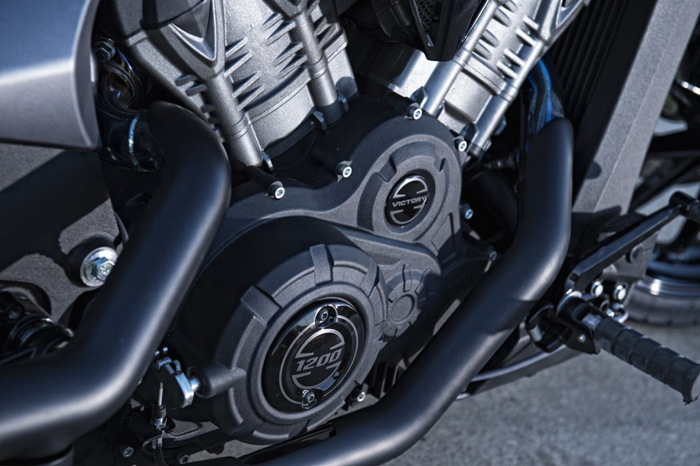 First, it comes with a liquid-cooled, 1179.3cc V –twin engine and second, the chassis is lightweight. It weighs 243kg and comes with a number of features that were first seen on the Project 156 Pikes Peak bike made by Victory last year. The 156 was Victory’s first water-cooled bike and it was arguably the brand’s first performance bike. And its 73.6mm stroke has made the move over to the Octane, allowing for higher rpm and quick revving. That’s been coupled with a 60mm electronic throttle too. The changes have been rung at the front of the Octane too, with sharper steering and a 32 Degree lean angle never seen on a V-twin before. The Octane, a massive break from the norm for Victory, can clear 0-60mph from standstill in less than four seconds, making it the quickest model from the American manufacturer. The American muscle bike, as it’s being marketed, is available in Europe from €12,950 however UK prices are yet to be revealed. If you get your hands on one of the first 100 Octanes to be built, you’ll also get a special engine cover with the Project 156 logo on top.